100,000 LB of sandstone and marble. This stone is for Saeid, it is ready for the crane to lift the top piece off which will be the one he uses. The other will make a cool table or vertical panel. 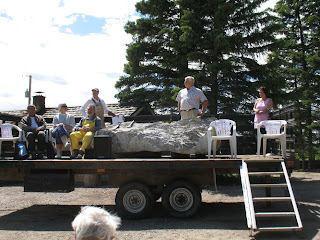 The top piece, that wieghs about 24,000 lbs, was lifted with chisels and big steel wedges. This year we have an exhibit that we are really excited about. 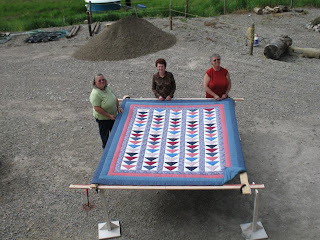 the Bergen Ladies Aide group makes beautiful hand stiched quilts. On Tuesday members came over to install the exhibit of four wonderful examples of this wonderful artform. They are exhibited in the loft of the barn, with spotlights on each of them it is a great way to make use of that space. 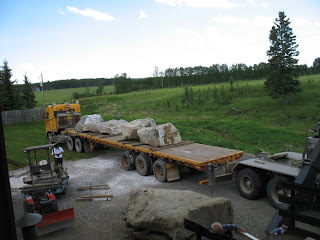 Wednesday the stones arrived, it tooka good part of the afternoon to unload them. While we were doing that Peerapong arrived and started to measure and check his stone carefully even before it was unloaded. 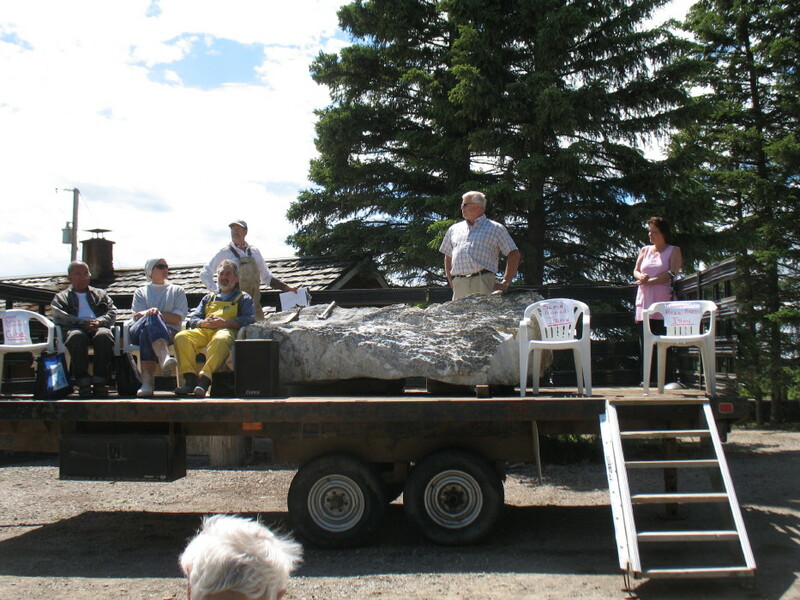 Sculpting began on Thursday, opening ceremonies were held Saturday afternoon with the three scuptors who are here now and a nice little crowd of arts enthusiasts. Despite having participated in at least three international arts events in Canada, freely sharing his artistic inspirations and techniques with local artists and creating public artworks that have helped to make the events successful Carlos was refused a visa to enter Canada by our consulate in Cuba. Mohamad and Saeid will both be late due to delays in having their Visas issued. In European and Asian countries artists are typically given similar considerations to atheletes when applying to participate in international events, maybe that convention will be adopted in Canada when our government recognizes the significance of the contribution these artists make to our society.